The international reference laboratory Campden Bri has trialled the CDR FoodLab® to establish whether it could meet the requirements for analysing a number of important food quality parameters. This is an abstract from the Campden Bri document. The fat/oil samples used were from commercially available products, aged samples stored at Campden BRI or provided by the client, and used as found. Samples were selected to cover as wide a range of AV, PV and FFA results as possible. The repeatability data was performed on an aged sample of olive oil. Anisidine Value was determined using the CDR FoodLab® instrument and the Campden BRI laboratory method (Campden BRI Method TES-AC-360). 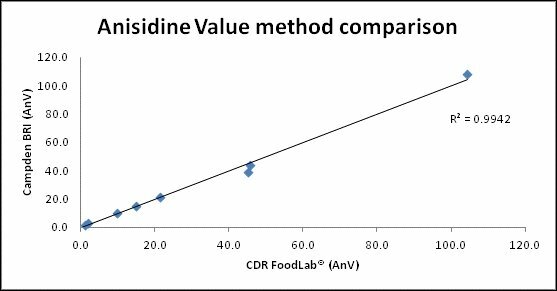 The Anisidine Value data for the CDR FoodLab® was found to be reasonably consistent across the three replicates even at relatively low values, as demonstrated by small standard deviations. When the data was compared to the Campden BRI laboratory data the correlation, R2,was found to be 0.9942 which indicated that the signal from the instrument was proportional to the Anisidine Value in the samples as determined by laboratory analysis. Peroxide Value was determined using the CDR FoodLab® instrument and the UKAS accredited titration method used by Campden BRI (Campden BRI Method TES-AC-511). The data for Peroxide Value using the CDR FoodLab® was also found to be very consistent with good reproducibility across the triplicate runs. When the data was compared to the Campden BRI laboratory data the correlation, R2,was found to be 0.9681 which indicated that the signal from the instrument was proportional to the Peroxide Value in the samples determined by laboratory analysis. Free Fatty Acid content was determined using the CDR FoodLab® instrument and the titration method used by Campden BRI (Campden BRI Method TES-AC-211). 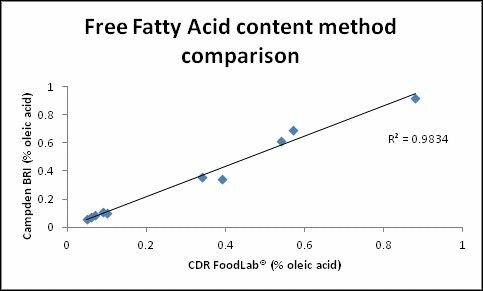 The data for Free Fatty Acids using the CDR FoodLab® was also found to be very consistent with good reproducibility across the triplicate runs. When the data was compared to the Campden BRI laboratory data the correlation, R2,was found to be 0.9834 (see Figure 3) which indicated that the signal from the instrument was proportional to the Free Fatty Acid value in the samples determined by laboratory analysis. To assess repeatability of the instrument more thoroughly, a sample of olive oil was tested ten times using the CDR FoodLab® and the relevant Campden BRI reference methods. 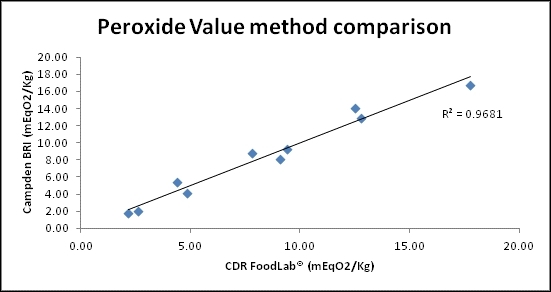 The repeatability data produced by the CDR FoodLab®, as expressed through the standard deviation of the ten replicates, was good for all three analyses. The data suggests that the CDR FoodLab® had slightly lower precision than the reference methods for AV and PV but well within acceptable limits for an instrument of this type. The assessment of the ability of the CDR FoodLab® to analyse for Anisidine Value, Peroxide Value and Free Fatty Acid content showed that the instrument gave comparable results to the reference methods with very high correlation coefficients suggesting good accuracy of results. Analysis of ten replicates of one sample of olive oil showed very good precision for all three analyses. The CDR FoodLab® is a self-contained unit requiring only a mains power supply. It is straightforward to use and requires no more than one hour of training. The instrument is maintenance-free and no additional equipment is required to analyse samples. The CDR FoodLab® instrument is very easy to use with minimal training and provides data faster than traditional laboratory-based methods. Good pipetting technique is required. Comparison study between CDR FoodLab® analytical methods and reference methods – Campden BRI was last modified: September 21st, 2018 by CDR s.r.l.